I received the comforter today and I am so impressed with the quality I love it and will be ordering another for my daughter. I bought a king for my queen bed because my bed is very high so I wanted full coverage with some overhang. I love it! Under The Canopy's EcoPure® Comforter combines earth-friendly materials with unparalleled comfort for a wonderful night's rest. Conscious without compromise, this comforter begins with a breathable, organic cotton shell paired with EcoPure®, an advanced, hypoallergenic poly fill made from upcycled plastic water bottles. The result is a lightweight, temperature-insulated comforter that's great for year-round enjoyment, as well as the planet. Additional details for this white quilted comforter include a two-inch gusset with a soft grey signature print and a small, embroidered keystone logo in the lower corner. Includes one comforter in your choice of Twin, Full/Queen, or King. EcoPure is a soft & lofty polyfill made from recycled plastic bottles. Reduces the burden on the world's landfills and natural resources by recycling. Dimensions 96.0 In. X 92.0 In. X 3.0 In. Absolutely love this comforter. We had just moved and I was in need of a new comforter. I slowly started switching my household/beauty products to everything organic/natural and I stumbled upon this brand, Under the Canopy and love it. It hasn't made me sweat and it's super comfortable. Haven't washed it yet, but considering the material and how great it is now, I'm sure it'll hold up in the wash! This is so well made. I love the even design, weight, substantial feel and it's very warm. 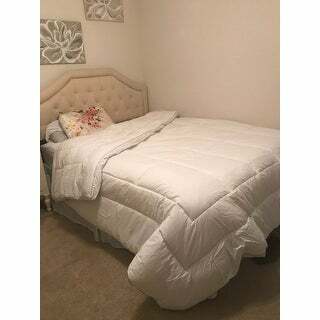 I had to give up for now since northern California nights are very mild and this lovely comforter is a bit too warm but it will be cozy this Fall and winter. Organic cotton is wonderful. I was unaware that the inside was not a natural product but polyester. Still, it's such a lovely comforter and is oversized which adds luxury and elegance. This comforter is fantastic! I searched endlessly for a king comforter in these dimensions. Most are significantly shorter and barely cover my mattress. This one is generously sized and hangs down and covers my box spring as well! The box stitching makes it lay so nice. I’ve added a photo, please excuse the mess! Can’t post on temperature comfort at the moment. So far it’s a beautiful product! My husband said it was one of the best night’s sleep he’s had in years. One problem: most comforter covers I have found so far don’t fit this comforter. I will find one though! 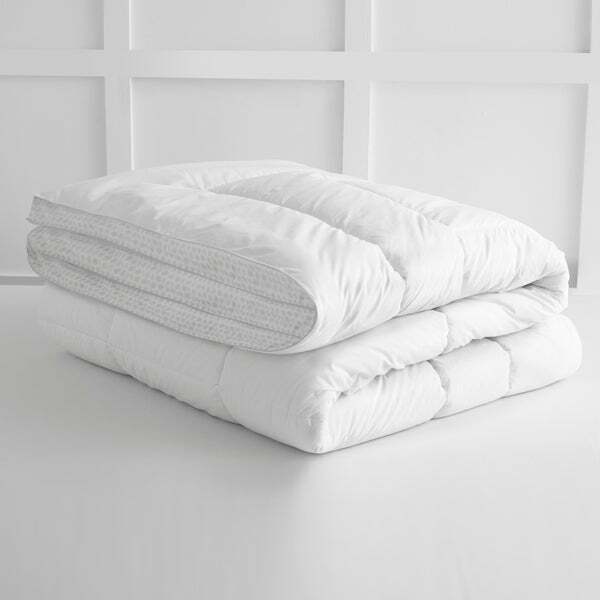 This is a beautiful comforter that is soft and heavy to add the warmth. The comforter can be stand alone as I am using it now or used with a duvet cover. This comforter surpassed my expectations. It is cozy as all get out and is a perfect fit for our twin guest bed. I like Under The Canopy items and will return to buy more for a new lake house. Love this comforter! It's the perfect weight so far - ranging from temps of 30s to 80s. Feel great about purchasing organic at a reasonable price. Just what I was looking for. 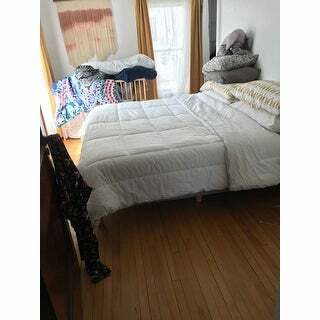 I don’t have a boxspring, so it is definitely too big for my full bed, but would be perfect for a full with boxspring or queen. Very very warm - happy with the material (organic cotton) and it has a really nice thickness/puffiness to it. Overall, very happy- but this may not work in the warmer months. Looked like a solid quality product plus like eco/green products. And the price was right! "What are the dimensions of the twin sized comforter?" Twin size dimensions are 68 inches wide x 90 inches long.